You're on the subway and you get the brilliant idea to host a TV viewing party for your friends for the premier of Conan O'Brien's new show. You pull out your phone (or your iPad) and start typing names into the compose page at gmail.com. (Yes, it works on the subway.) You've added Naveed, Suzy and 7 others before you remember that Naveed made you eat grass at the last BBQ. You want to remove him from the list but his email address has scrolled way out of view. Argh! After some intense scrolling and lots of backspaces, you finally manage to get rid of Naveed's email address. Enter our redesigned Compose page. It has new address fields that automatically expand to fit all the email addresses that you're entering, so you'll never have to worry about this type of problem again. As always, when you start typing an name into the new compose view, you'll see possible contact choices in the autocomplete dropdown. When you select a contact from the autocomplete dropdown, only the person's name is entered into the address field. This saves screen space and won't leave you thinking "man, who is hikingfan@gmail.com?" when you're reviewing an email before sending. Once you select a contact from the autocomplete menu, you'll also notice that the contact becomes an object that you can tap on. Tapping on a contact opens a detailed view that let's you double-check the person's email address or remove them from the email. Yes, this means you can remove an email address in two taps! Remove the contact you just added by tapping Backspace. Press the '+' button to see your top contacts, or hide them by pressing the '–' button. The page now fills the entire screen, giving you more space to see what you're writing. This update is available for Android, iPad, iPhone, and iPod Touch devices. We always love to hear what you'd like to see next, so be sure to leave your feedback in our Help Forum or the Mobile Product Ideas page! The new compose page looks very clean. Any chance that custom From: addresses enabled in the desktop web client will become accessible from the mobile site? 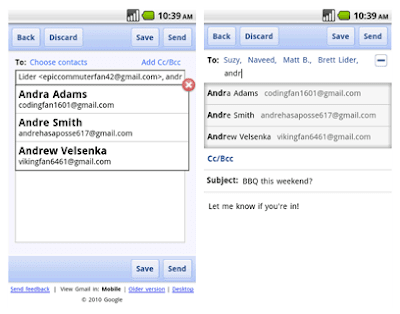 I would like to see work on the Android Gmail app. Why has it not been updated?! If I'm writing in email in from my browser on the subway, what happens if I lose reception, in terms of autocomplete and actually sending the email? Why is it that Blackberry users continue to be left in the dust? "Tapping on a contact opens a detailed view that let's you double-check the person's email address or remove them from the email." Will they update Gmail client on Android like this too? This is already exemplified in the WebOS email client. I guess Android is finally catching up. When you want to delete a recipient, you re-select it, the original address gets highlighted and all other email addresses are displayed so you can either 1-backspace to delete the recipient or 2-select a different email for the recipient. WebOS is soooo much better than Android. It's a functional OS rather than a toy OS. Please please please add support for multiple email addresses from the one account. I have about 5 other email addresses all linked to the one gmail. If i send from one account to the other using my desktop computer, and then "reply" from my mobile using the new system, not only does it send from my default account, but also TO my default account. You really need to add the ability to choose in the mobile webmail which account to send from and it should auto reply from the address an email was sent to (like the desktop client). Many people depend on being able to do this! agreed with yellow jacket but the hardware blows compared to the EVO which is why I am moving from pre to EVO and webos is a little bit better than android in some things but unfortunately the hardware isn't there and palm might be dead before we know it. google should make this update for the web gmail on webos browser and does this support contact groups? Is there a way to display images in received messages in the webapp? Am I totally missing something? I don't see a link/control to show images. Thanks for the update but I'm still crippled by the fact I can't choose From: address on the Droid app, both mobile versions, and the mobile desktop version. It's sad I have to rely on a 3rd party software to be able just to do this one function. Looks nice, but "+" signs is much to close to "Send" button. I tap "Send" by mistake quite often!!! !